I have recently considered the possibility that chickens could be better if they were more ball-like. I actually think I already did one of these types of things before but I'm too lazy to actually check and this one is new at any rate so it counts. He's got all the key aspects besides body shape. He's even got feet. You know I'm lazy about foot-have. I hate this guy! If I saw a chicken like this I'd kick it! 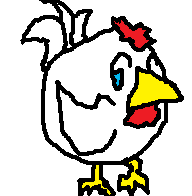 But then, a chief purpose of art is to evoke strong emotion, not necessarily to get people feeling sympathetic towards chickens. So there's success, here. Man. I need to check my strong reaction at the door, some times. It's not even this chicken's fault! He reminds me of somebody, I can't put my finger on who, but if I see him...kick.